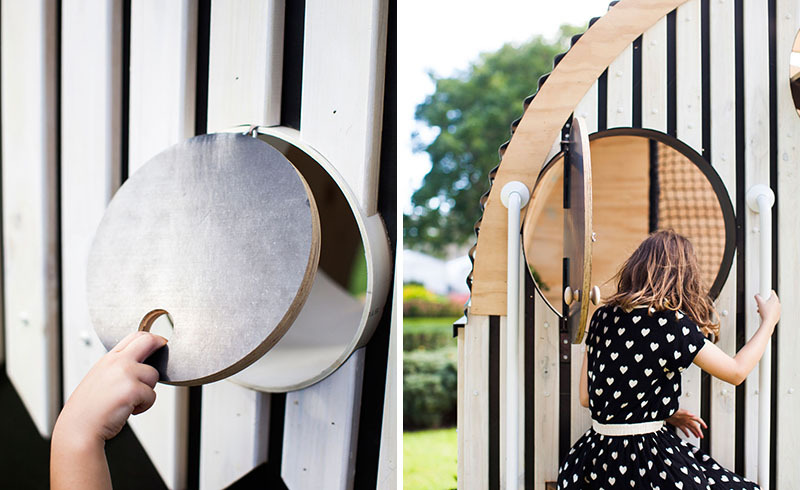 Give your kids a unique playhouse like this one with a contemporary design! When we were kids, we always wanted to have our own playhouse. Of course! Who wouldn’t want to have a space that we can call ours and invite friends over to have some fun? That would feel really amazing as a child. But even grownups would like their kids to have their own playhouse as well because I guess we know how it feels like to be kid. Some children and blessed to have a spacious home wherein their parents can actually add a play house. For those who don’t have enough outdoor space, they just add a play area inside the house. Today, we are going to feature a play house with a beautiful modern contemporary design. The project is called Vardo Hut Cubby. 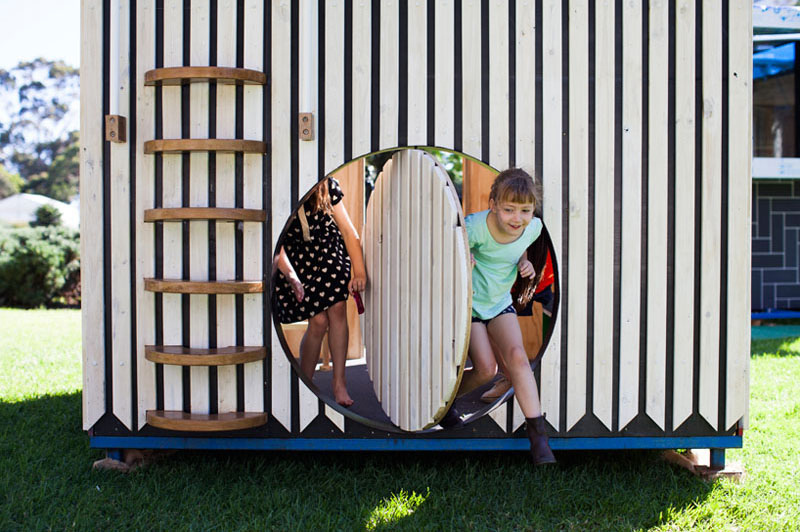 With the looks of it, Doherty Design Studio has raised the bar in terms of what a standard playhouse or cubby house should look like. For sure, you will agree with us once you see the play house below. At first glance, it doesn’t look a play house especially that it has hanging plants and the shape is queer. But as you look closer especially in the interior, you will realize that it is indeed a cubby house. Well, you will even be more convinced when you see kids playing around the area! Let us take a look at this unique play house below. 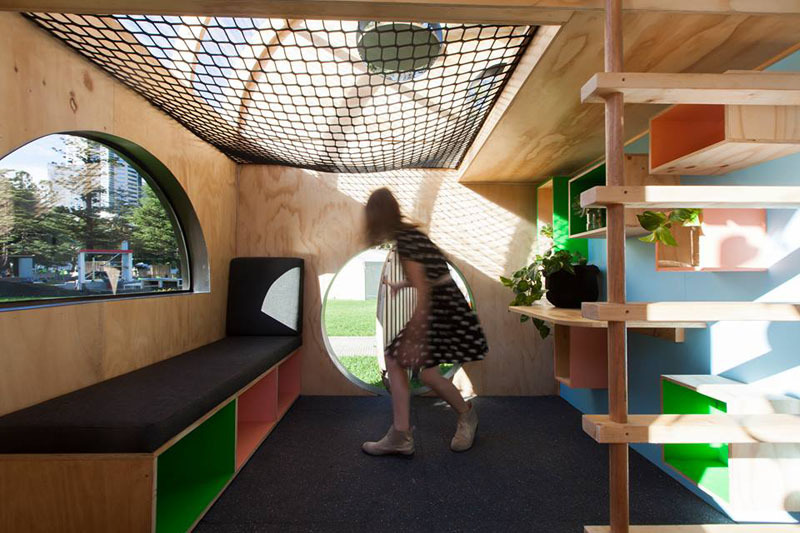 Unique feature: A unique contemporary cubby house for kids that will surely make you look at play houses in a different way! Isn’t this lovely? It sure is! You can see here the facade of the cubby house where has contrasting colors of black and white. It is obviously made out of wood with many interesting shapes around it. 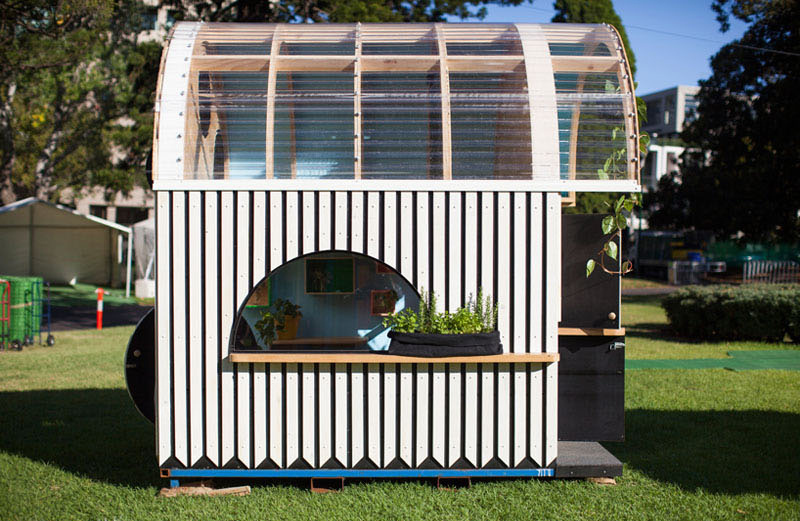 Plus, it has plants too which makes one wonder if it is indeed a play house or not. 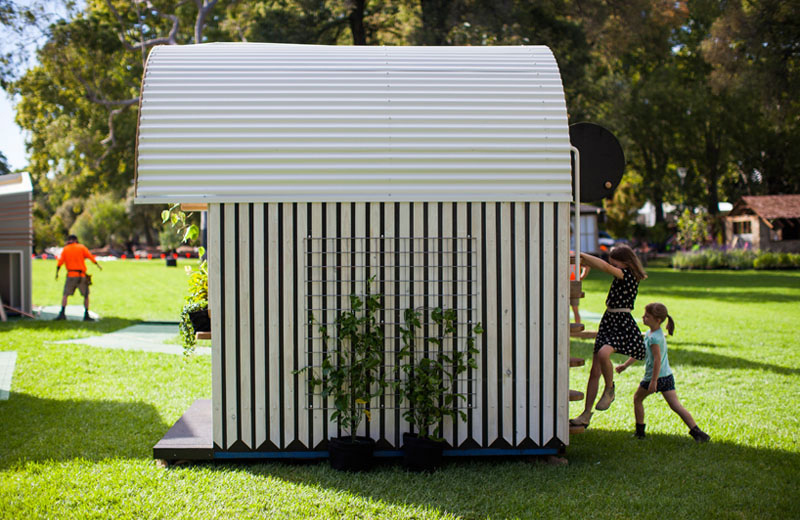 This play house is part of the Melbourne International Flower & Garden Show and was created to be auctioned off to raise money for Kids Under Cover, a not-for-profit organization dedicated to preventing youth homelessness. You can see that on this side it used a transparent plastic roof. But on the other side, it used corrugated roofing. You can also see that there are plants here with vines. Imagine how this would look like if the vines have grown! Although there is already a door at one side of the play house, there is another fun door on this side. It is circular in shape which is so cute! There are also curved ladder steps on this side of the cubby house. The contemporary playhouse is covered in white slats. 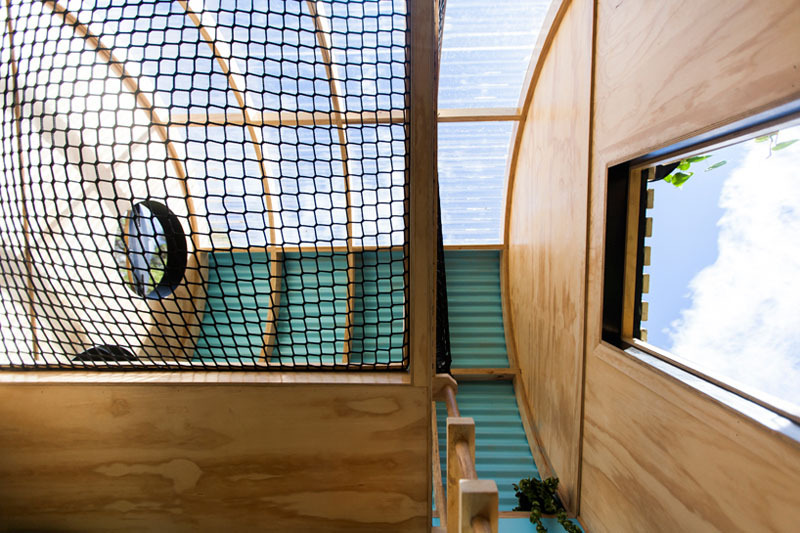 It also features round windows and doors that will give the kids a playful experience. It would indeed be nice to have round windows and doors, right? It is like something from a storybook! 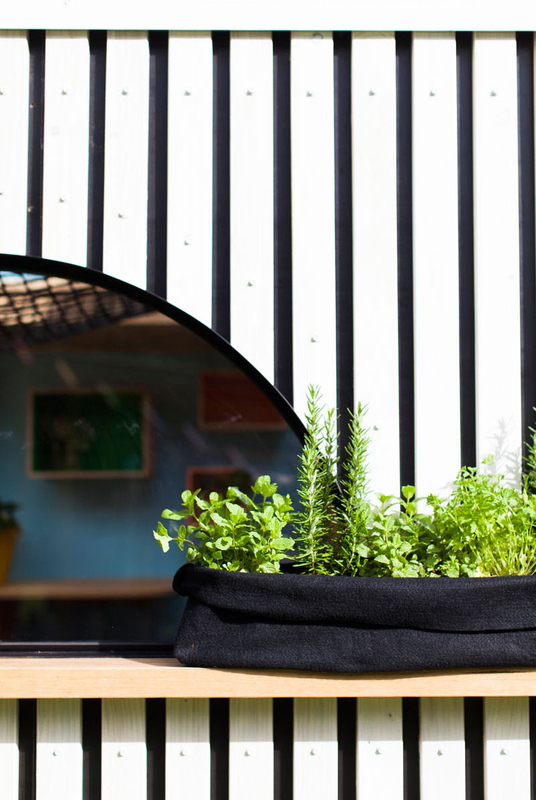 On the curved window, you can see a plant seated on its ledge. Aside from the plant, I just like the idea of the window being shaped this way which is reminiscent of its roofing design. 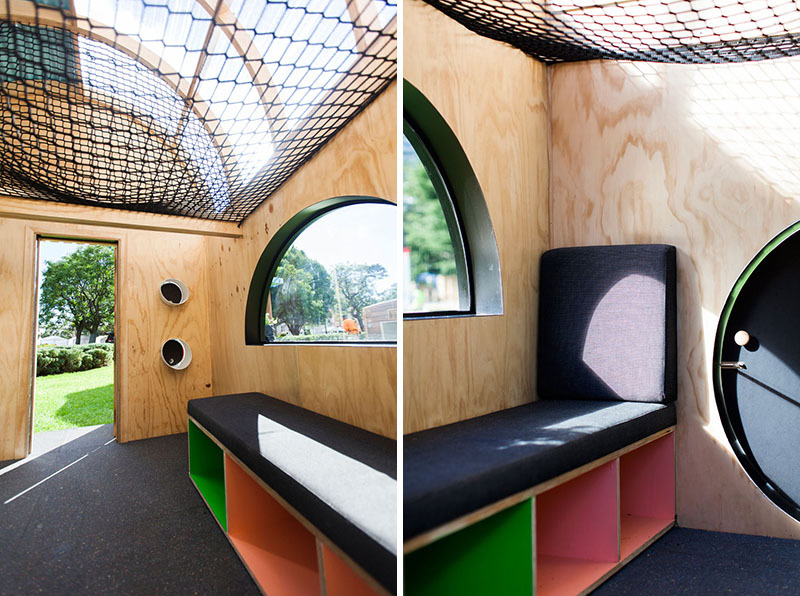 Inside the cubby house, there’s an upholstered bench and shelving. Under the bench are colorful open cubbies where toys and other items can be stored when desired. It could also be a nice place to rest and unwind. There is also a back door with a round shaped. It is a good way for keeping grown-ups out because only those who are small can get in. You can also notice that the flooring of the interior is carpet. On the other side of the play house are cubes on the wall which acts as shelves and are also colorful. Near the shelving that has colors inside it, one can see a ladder that leads up to the loft where a net for relaxing is found. You know how kids are, they love to climb and do many other exciting things! And this is the net part of the play house. Not sure if it is okay to jump here but it would require good balancing in order to walk on them. Of course, one has to hold on the net too in order to get through the space. From here, one can look outside through a glass window. Plenty of light enters the playhouse from the curved windows on the roof and also from the round glass windows around it. It would indeed be fun to have something like this in the backyard! Kids would be very pleased to have one. 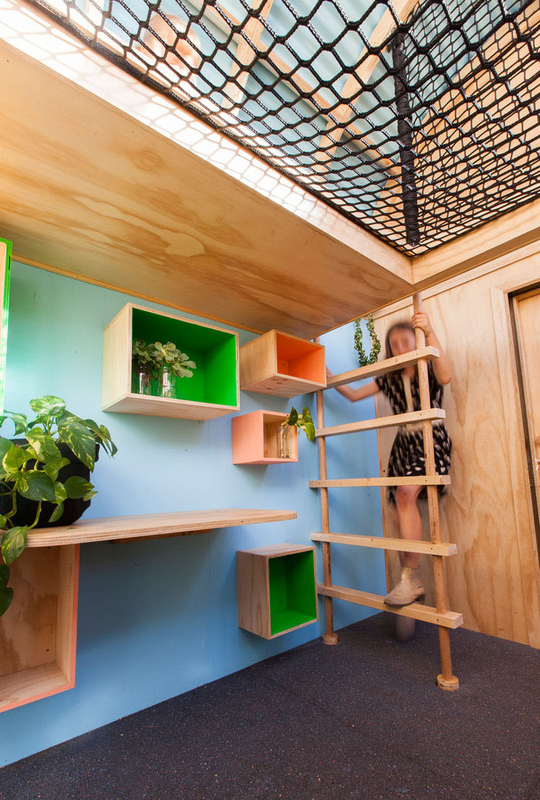 And with the size of this playhouse, it appears that even adults can also enjoy it but I am not sure if one can climb the ladder and play on the net as well. But of course, it is still a nice idea to have this kind of play area outdoors. This way, kids will be encouraged to play in the outdoor area. 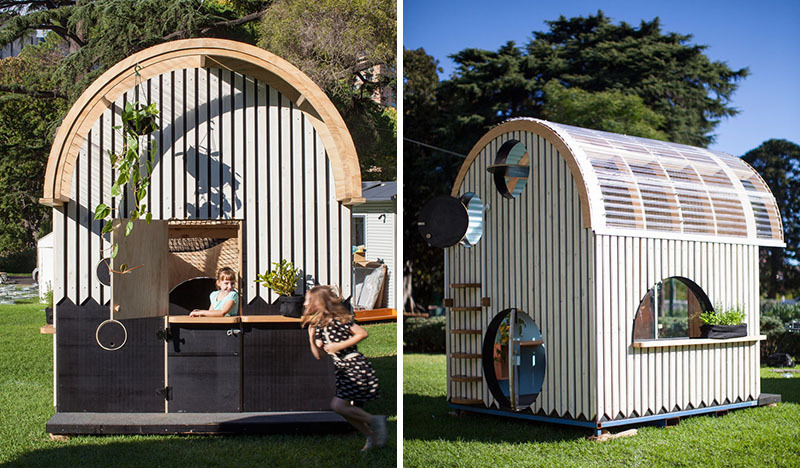 This play house is designed by Doherty Design Studio which looks really great for a cubby house. Instead of the classic design that we see in some areas, this one has a contemporary and modern touch to it. Do you like it too? Do you think you would have one for your kids?